I love this game! Even though I'm 20, I can still enjoy a fun little game of "Hide-n-Seek" right? This isn't like regular hide-n-seek though. Instead of you or a friend hiding, you hide "Bugger." Great concept, right? YES! I've always loved playing hide-n-seek. The only thing thats stopping me now is my size. I mean, we all know, it's not easy to hide when your a full grown woman. Well.. Thats where Bugger comes in! Bugger is an inexpensive game, that the whole family can play! Bugger is available online for only $6.99! The Giveaway! 1 of you will receive a "Where's Bugger" of your own! Mandatory : Visit the Where's Bugger Website and tell me something that you learned! ﻿﻿Disclosure: Review product was provided to me free of charge to ensure and honest review. All opinions expressed are my own, and were not influenced in any way. Only 1 entry PER HOUSEHOLD. Be sure to leave your email address in each comment.This giveaway will end April 15th, 2011 at 11:59pm. I learned that the Bugger game piece can be painted or customized with stickers. Thanks for the review and giveaway! I learned that shipping is only $2.50. I learned that the players concentrate on finding the object and not what is happening with a magic wand or a carrot! I learned that they accept Paypal! Sometimes if a site does not, that is a deal breaker for me! Sent you a Friends Request! I`ve learned that you could use the "where`s bugger" for Birthday and other parties. It is a great idea! learned that the Bugger game piece can be painted or customized with stickers. I learned that the game can be personalized. i learned that Where's Bugger is the New Way to play Hide & Seek & Sprint Games! I learned that All of their orders are sent first class US Mail delivery. Now following on twitter with katklaw777. especially useful for toddlers (with adult supervision)! #1 I LIKE Your NEW Facebook FAN PAGE! #2 I LIKE Your NEW Facebook FAN PAGE! I subscribed to your blog by email! 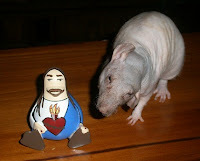 I voted for Lil Luis in the Agile Rat Photo Contest! I learned that the company was established fall 2010. I added you as a friend on Facebook under the username likwan. I tweeted the requested message at http://twitter.com/likwan/status/55522548020027392. Hi! I learned that Where's Bugger has a chicken-motiff design, which I LOVE!! I follow your blog, liked your facebook page and now follow you on twitter as well! (my name is stonecoldcrazy9 there) What is your facebook page so I can friend you there as well? I entered your $10 Walmart giftcard giveaway. 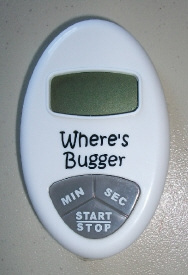 I learned that Wheres Bugger makes a great novelty gift. I learned that you can make your own design.